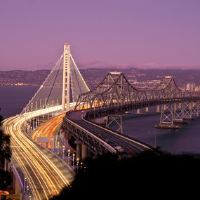 As we have noted many times, the new eastern span of the San Francisco Bay Bridge was 10 years in the making and a whopping $5 billion over budget, but all that time and money could not guarantee safety for the public. Before he moved to Congress in recent elections, state senator Mark DeSaulnier held hearings in which Caltrans whistleblowers called for a criminal investigation. None took place, but the safety issues persisted, with cracked welds and problems with bolts and rods. And now as CBS reports, one of the Bay Bridge’s anchor rods failed a major test. The rod “moved easily when tugged on, which may mean it corroded from exposure to water and fractured. Significant levels of corrosive chloride were found in some sleeves that hold 25-foot long steel rods at the base of the tower.” As many as 100 rod sleeves were affected, according to the CBS report. The Toll Bridge Program Oversight Committee approved $4 million to study the problem. According to Committee chairman Steve Heminger, if it were an “ongoing intrusion,” this would be a serious problem “and would require an investigation of the foundation itself.” In 2013, 32 rods failed and that required an investigation costing $45 million. None of this was supposed to happen, and as Mark DeSaulnier has lamented, “it’s frustrating that there’s never been anyone in the management of the bridge who has been held accountable.” Key Caltrans boss Tony Anziano conveniently retired. According to state transportation officials, the bridge remains safe, but around the Bay Area some aren’t so sure. As we noted, UC Berkley structural engineering professor Abolhassan Astaneh-Asi declines to use the bridge. Meanwhile, demolition of the old span continues, and companies such as Google, who seek to use private ferries for their employees, must contend with the Water Emergency Transportation Authority. During a five-day trial, the WETA has ruled that Google workers will not park in the Harbor Bay Ferry lot.